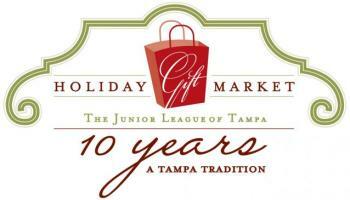 Tampa's LARGEST Holiday Shopping Event this weekend! Tampa&apos;s LARGEST Holiday Shopping Event this weekend! Founded in 1926, The Junior League of Tampa, Inc. is an organization of over 1,800 local women committed to promoting voluntarism, developing the potential of women, and improving communities through effective action and leadership of trained volunteers. These Tampa women participate in many fundraisers and community events including their largest event, The 10th Annual Holiday Gift Market at the Florida State Fairgrounds. The League&apos;s 9th Annual Holiday Gift Market at the Florida State Fairgrounds is one of The League&apos;s largest fundraisers. 100% of net proceeds from Holiday Gift Market will benefit The League&apos;s programs in child welfare and literacy. This year, more than 135 specialty merchants are taking part in a “10 year Tampa Tradition”. This is not only a great way for people to shop for a good cause, but help support local Tampa Bay businesses. Holiday Gift Market is fast approaching and kicks off on Friday, November 9 and continues through Sunday, November 10. November 8th, Friday: 9 a.m. - 6 p.m.
November 9th, Saturday: 9 a.m. - 6 p.m.
November 10th, Sunday: 9 a.m. - 5 p.m.
Get a head start to your holiday shopping! There is nothing better than the combination of shopping and giving-back, this event will be sure to get you in the holiday spirit this season!